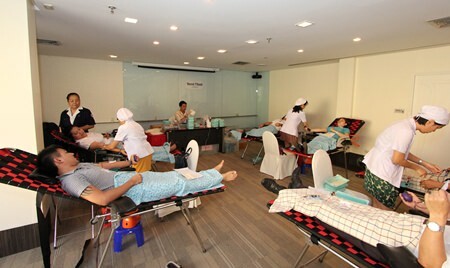 Fifty employees from the Dusit Thani Hotel donated blood to patients needing regular transfusions during a mobile blood drive administered by the Chonburi Red Cross. 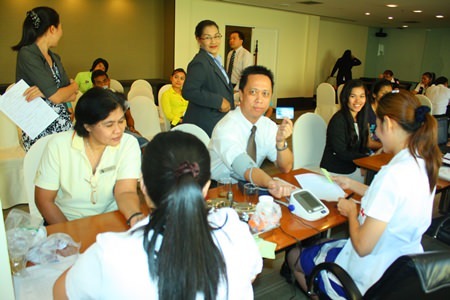 Residence Manager Neoh Kean Boon led staffers in the March 31 event, which collected 830 units of blood totaling 2,500cc. The Dusit Thani Pattaya is a branch of Dusit International, founded in 1948 by Chanut Piyaoui. The first hotel was the Princess on Charoen Krung Road in Bangkok and today Dusit has a portfolio of deluxe hotels: Dusit Thani Hotels & Resorts, dusitD2, Dusit Princess, Dusit Devarana, and Dusit Residence Serviced Apartments. It also operates the Devarana Spa. 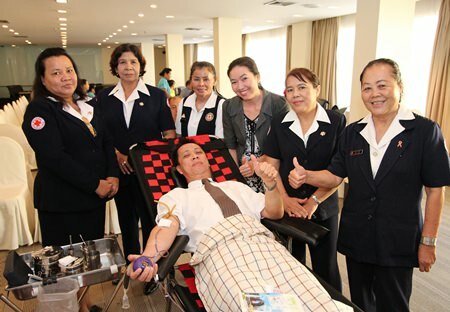 Neoh Kean Boon, Resident Manager of Dusit Thani Pattaya donates blood to the Red Cross.